Rats are part of a larger group of mammals known as rodents of which there are over 2,700 different species throughout the world. In the UK there are 14 species which include voles, dormice, squirrels, and of course mice. The word rodent is derived from the Latin verb rodere which translates into English as to gnaw. Rodents do not just gnaw for the sake of doing it. They have to continually wear down their paired incisor teeth. Their incisor teeth have only one side covered with enamel and they continue to grow. This growth in rats can be 5 inches per annum, therefore the gnawing keeps these teeth at a reasonable length but because of the one-sided enamel covering also keeps them sharp. In the UK we are reasonably fortunate in that we only have one species of rat though it may be found in many different environments. This was not always the case. Years ago we also had the black or ship rat which in fact had been in the UK previous to the arrival of the common rat. The ship rat probably originated in Southeast Asia and was thought not to have reached Western Europe until the Middle Ages, possibly returning with the Crusaders. However remains have been discovered in Roman deposits in York and London dating back to the 3rd and 4th centuries. Although once the dominant rat species in this country it is now rare and confined mainly to port areas in Tilbury, Liverpool and Avonmouth. It may be found very occasionally in some inland towns especially those linked to ports by canals. In buildings it is commonly found in the upper story or the roof. Rats are mainly nocturnal and are mimimally active during daylight hours. The two peak periods of activity generally follow the onset of darkness and just before sunrise and coincides with the period of greatest food consumption. However, when food is scarce or when populations are dense and subject to little disturbance rodents may be seen during the daytime. Their feeding patterns and other activities can also change according to local circumstances and will be affected, for example, by shift work in factories. If food and a place to hide are well established rats tend to have a restricted home range (area of normal movement) and follow regular routes. Their ranges tend to be smallest when they are living in areas such as food stores, where food and cover are generally on tap. Rats tend to live close to their food source if possible so that excessive daily movements are unnecessary. However, regular journeys of more than one kilometre have been recorded on farmland when the rats usually kept to the shelter of hedgerows. Rat colonies typically develop from a pair or a single pregnant female. The animals within a colony will be able to recognise each other and behave socially with each other. The territory of a rodent colony is an area that is smaller than its home range and is defended by members of that colony. Any intruders into the territory are repelled vigorously and may even be killed. Defendable sites may be the only ones that can be used successfully for raising young and can be the limiting factor for population numbers in a particular area. A dominance structure develops as population density increases. High-ranking individuals usually occupy favoured positions close to a food source. Low-ranking members of a colony may be allowed to feed only while dominants are inactive, for example, during daylight. Male rats will also compete to gain access to a receptive female – the stronger, more vigorous males copulating with the female. Rats can breed even more efficiently than rabbits and large infestations can develop very quickly from a single pair and start at around 3 months old. Rats on average can produce 6-8 litters per year of around 6-11 rats per litter. These are weaned at 1 month. Conditions that suit a rapid population increase are listed below. Under these optimum conditions rats may breed throughout the year. In less favourable habitats commensal rodent breeding takes place mainly in the summer and autumn. In the wild rats rarely live beyond a year though in captivity 2-3 years is not unusual. The most serious problem is disease and the most serious disease is Weils Disease or Leptospirosis. This is a fatal disease transmitted by rats to humans (and other animals) via bacteria in the rats’ urine. The rats themselves are unaffected by the disease but if the bacteria manage to get into your bloodstream then the resulting infection can be fatal if not recognised. The worrying aspect is that if the rats urinate in a damp area (long grass, around or in a pond) then the bacteria can remain active for up to a month after. The way you can get the bacteria into your bloodstream is via cuts or even ingestion by not washing your hands properly. There has even been a case where the bacteria were transferred by drinking from a contaminated bottle of lager! Other diseases to humans including Salmonellosis, rat-bite fever, listeria, toxoplasmosis and toxacaria. Rats can also cause significant problems by gnawing some quite solid and tough objects. Their teeth are very hard and slightly curved enabling them to exert a pressure of 7,000psi. This means they can chew through soft metals such as lead and aluminium as well as thick wood and even breeze blocks. If they get into buildings then electrical wiring can be damaged leading to fire risks. The majority of people find the nearby presence of rats disgusting and even frightening and hearing them scurrying within a cavity wall or loft at night can cause a great deal of stress and anxiety. This stress and anxiety is often repeated when their rat pest control efforts have involved the use of rat killer or rat poison only to be left with the foul stench of a rotting rat carcass in a wall or ceiling cavity. 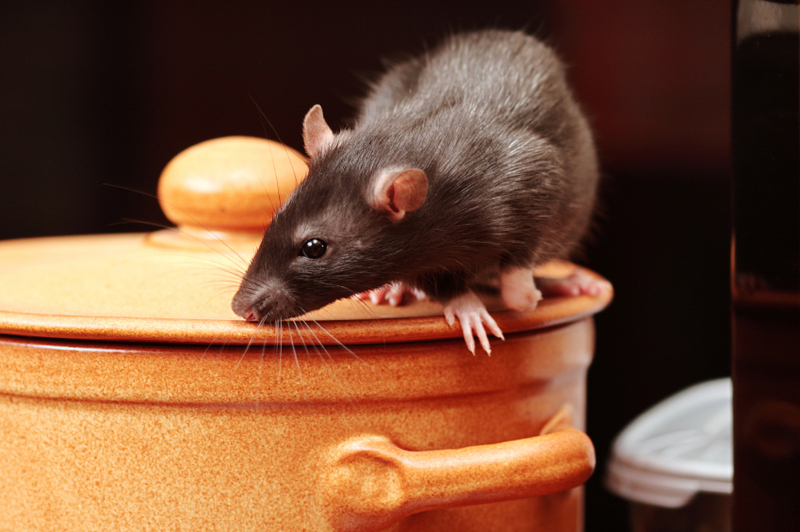 The dealing of rats is best left to the professionals like our team at Pesky Critters. If you think you have a problem with rats then please contact us for a free survey.